This is not my entire collection for May 2014, I would call it 75% of May’s finds. I started metal detecting this year (March) and love every door this hobby has opened for me. The relaxation, exercise & mystery that every hunt brings excites me. I’m 49yo and just getting started in this hobby, why did I waste so much time? 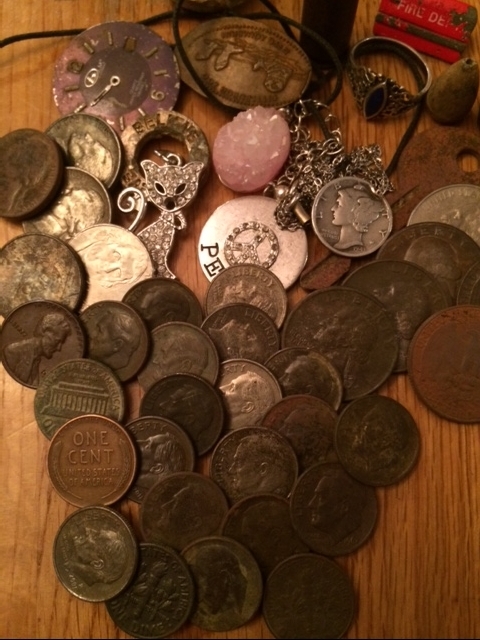 I have collected coins my entire life and history is a love of mine. All the ingredients for metal detecting were right in front of my face early in life, if only I listened to the signs. So to answer my own question, I don’t know. One thing for sure, I will not waste another day of my life, all my free time will go to metal detecting, and not golf like a lot of my older friends are into (Big $$$ Hobby). So follow me through my journey in this hobby as I have so many great thoughts in mind as to where I can take this hobby. Amazing!! I love you, Dad!!! Love you too. Go with me on my next hunt?